With a convertible roof that folds flush, the Range Rover Evoque Convertible is stylish with the top down or up. 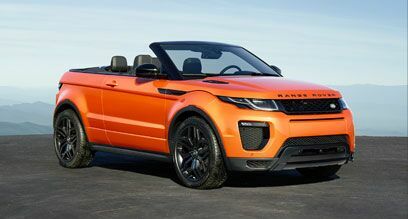 Building off the perfected interior and exterior of the Range Rover Evoque, this convertible companion has all the capability of its hard-topped brother. Drop the top, take in the scenery, feel the wind in your hair, and know that you are alive. Land Rover builds their vehicles for any road that life can throw your way. Covered in snow, glazed in ice, caked in mud, or piled over with sand, a Land Rover with the Terrain Response® System can always handle it. The system adapts to the road around you at your command. The Range Rover Evoque Convertible comes equipped with a revolutionary Z-Folding roof system that folds down flush in 18 seconds. No need to stop to make the transition either. You can fold the top up or down at driving speeds of up to 29 miles an hour. 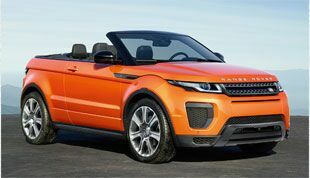 In the event of a roll over, the Range Rover Evoque Convertible will deploy two aluminum bars. These spring forth from either side of the car just behind the rear passenger seats, providing the safety of a roll bar without all the ugly bulk. This convertible SUV is stylish and safe. Now you can enjoy the open air on any road and even places where no road will go. This is still a Land Rover. It can take on any challenge and go any place that you want to go. Take it over dunes, through rivers, and up snow packed mountains. Or just drive through the city and turn heads wherever you go. 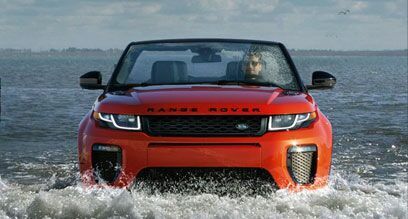 The Range Rover Evoque Convertible is ready for anything. *Price shown is Manufacturer's Suggested Retail Price. Excludes $995 destination/handling charge, tax, title, license, and retailer fees, all due at signing, and optional equipment. Retailer price, terms and vehicle availability may vary. See your local authorized Range Rover Retailer for details.